Oro Valley Arizona is where the Oro Valley Country Club is located. 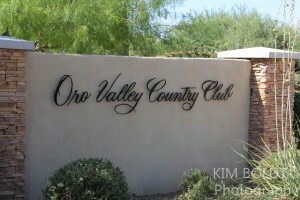 Oro Valley C. C. was established before the Town of Oro Valley Arizona was established. Opened in 1958, the Oro Valley Country Club provides its members a traditional mid-western golf course in the desert. The large trees make the fairways seem more narrow and the lake to the right of the 18th hole awaits the errant long approach shot to a relatively small green. The Clubhouse was recently rebuilt and provides members a spacious facility for dining, entertaining and parties. A new fitness center complements the tennis courts and golf practice area. Oro Valley Arizona is a planned community. It is cradled in the shadows of the magnificent Santa Catalina Mountains. There are numerous hiking and bicycle trails throughout the Town. Oro Valley Arizona also provides world class golf courses, horseback riding and a long valued cultural tradition. Located just miles north of the Tucson city limits and reasonably close to the University of Arizona and Tucson International Airport. Oro Valley residents are served by the Amphi School District. Looking for a Home For Sale In Tucson OR Oro Valley Homes by School? We can help! Questions about the Tucson Real Estate Market or Oro Valley Homes for Sale? Call Us 866 316 5575 OR complete the CONTACT FORM and we will get right back to you!